Pull-ups strengthen the latissimus dorsi muscles, the large muscles of the back below the shoulder blades. 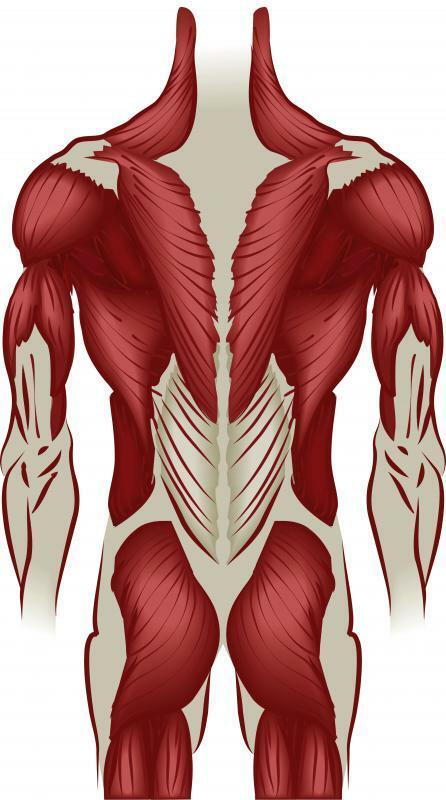 Having well developed lats, or latissimus dorsi muscles of the back, along with a thin waist, give athletes a v-shaped torso. Pull-ups are performed by lifting the body off the ground while grabbing onto a raised bar, using the muscles in the back, arms and hands. A pull-up is a compound exercise that involves an athlete pulling himself or herself upward while gripping a raised bar. This exercise primarily targets the latissimus dorsi muscles but also benefits the middle back and bicep muscles. It is very similar to a chin-up except that the pull-up uses a pronate grip rather than a supinated grip, although there is a variation in which each hand uses a different grip. There are several different types of pull-ups, and each type stresses the muscles in slightly different ways. The most common type of pull-up is the standard pull-up. In order to perform this exercise, the athlete hangs from a fixed bar with the hands a little bit wider than shoulder width apart. Then, without swinging or using the body to generate any excess momentum, the arms are used to pull the athlete up until his or her head is higher than the bar. The pull-up ends when the athlete lowers himself or herself back to the original hanging position. Another common form of the exercise is the behind-the-neck pull-up. This variation is almost identical to the standard pull-up except that the athlete lowers the chin to his or her chest while performing the exercise. Rather than trying to lift his or her head above the bar, the athlete lifts until the back of the neck comes in contact with the bar, then lowers his or her body back down. This variation requires very precise form, because the head isn't in a stable position, and excess momentum can lead to neck injuries. In addition to these common variations, there are other forms of pull-ups that offer slightly different benefits. A muscle-up requires the athlete to perform a normal pull-up but, rather than stopping when his or her head is above the bar, the athlete uses his or her momentum to continue to rise above the bar. Eventually, the athlete straightens his or her arms completely, and the entire top half of the body is above the bar. 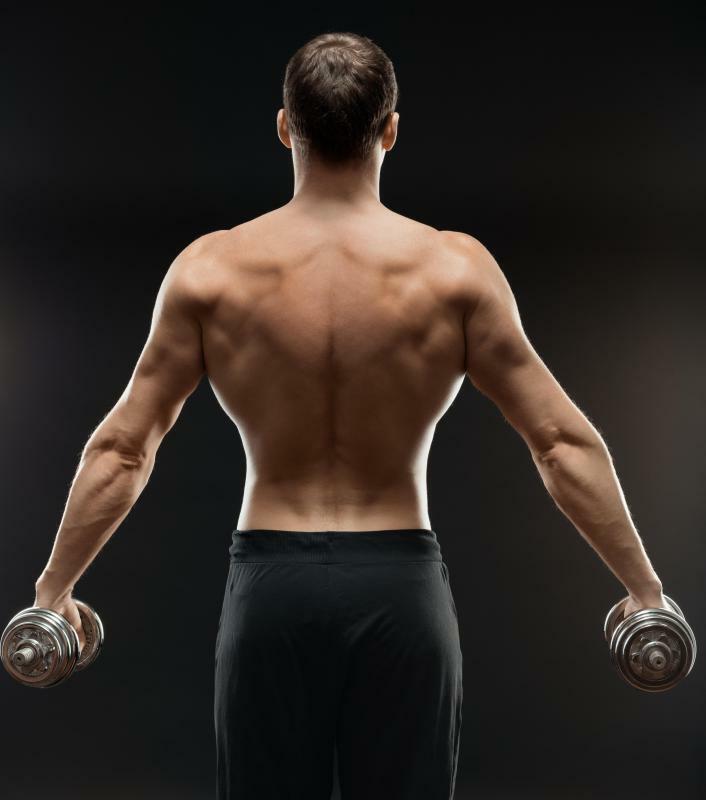 This exercise has the added benefit of working out the shoulders and triceps. Supine rows, which sometimes are called reverse push-ups or inclined pull-ups, require the athlete to start in a very different position. The heels are placed on the ground, and the athlete grips a fixed bar that is only a few feet off the floor, resulting in a position that looks similar to a bench press. The athlete then pulls his or her body upward until it makes contact with the bar before lowering himself or herself back toward the floor. This exercise shifts some of the emphasis away from the latissimus dorsi and puts more stress on the upper middle back muscles and biceps. Pull-ups use the athlete's own body weight to provide resistance, so it can sometimes be difficult to increase the overall intensity of the exercise. In order to increase the weight, some athletes grip a heavy ball between their feet or attach weights to a specially designed belt. Another way to increase the intensity of the workout is to perform pull-ups with one arm. This variation uses only one arm at a time to raise the body, so it essentially doubles the weight that each arm pulls individually. What is a Wall Mounted Chin-Up Bar? Are Portable Chin-Up Bars Safe? How do I Choose the Best Doorway Chin-Up Bar? What is a Chin-Up Bar?